OML EmbroideryLearn.Stitch.Smile. FREE Embroidery Education for Everyone! !Tulip Design: digitize this design in less than 15 Minutes! Tulip Design: digitize this design in less than 15 Minutes! Learning a new skill can take time, and people learn in many different ways. It has been requested that I do some videos of how I digitize – step by step and in real time. I did not talk during this video, so you can concentrate on what I am doing. Some people learn by watching or reading, and some people learn by doing. In these videos (yes there will be more to come) you can watch the video and get the basics of the design, and then digitize the design yourself! 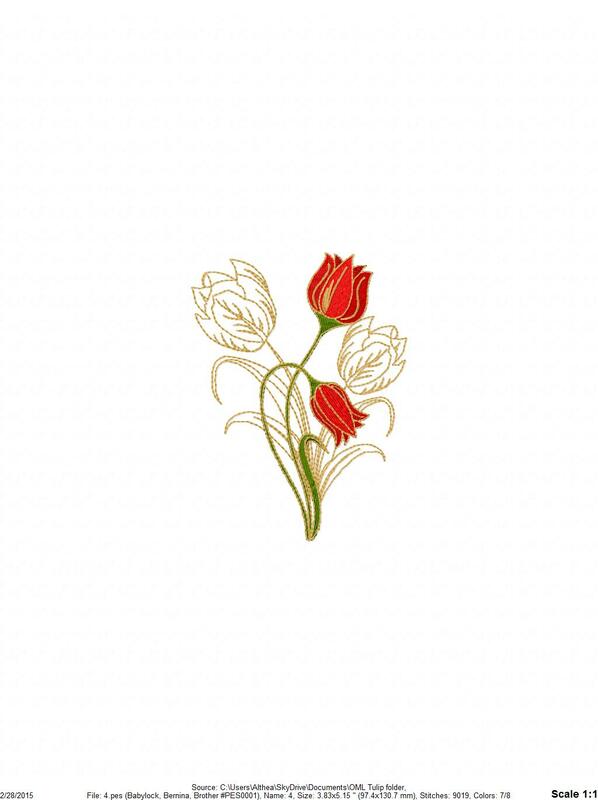 Click HERE to download the design, so you can digitize the tulips yourself! You can change the stitch types and the colors you pick for the tulips – add some flare and be creative. Post a jpeg of your final design! It will be interesting to see what everyone comes up with! Here is what Althea came up with. Excellent work, Althea!! I had sound on all of the first three videos. But I do not have sound with this one is it an error on my part or are we to do this without sound.